Forecasters in this Southern town of about 25,000 had told us a storm loomed, and as I headed home from work after 11 p.m. – traveling about a mile uphill – a light snow fell. Once home, I walked through living room, down the hall and into the kitchen, noticing mail on the floor, yelling at my sons in my mind for not picking up the mail, and going downstairs to check on them, making a mental note to pick up the mail when I came back upstairs. Back upstairs, I picked up the Friday mail and noticed one from a university where I had applied for a graduate school fellowship. Already, I had received two rejection notices that said something like, “Because we received packets from so many qualified applicants, we had to choose the best of the best” and then letting me know I wasn’t among the best. The first word of this letter, which I had found face-down on the floor, was “Congratulations,” and while I was thrilled to see that word, I had not decided to move to that state. My choice school was Washington University in St. Louis, and I held out hope that Washington University would give me a fellowship so I could go there. 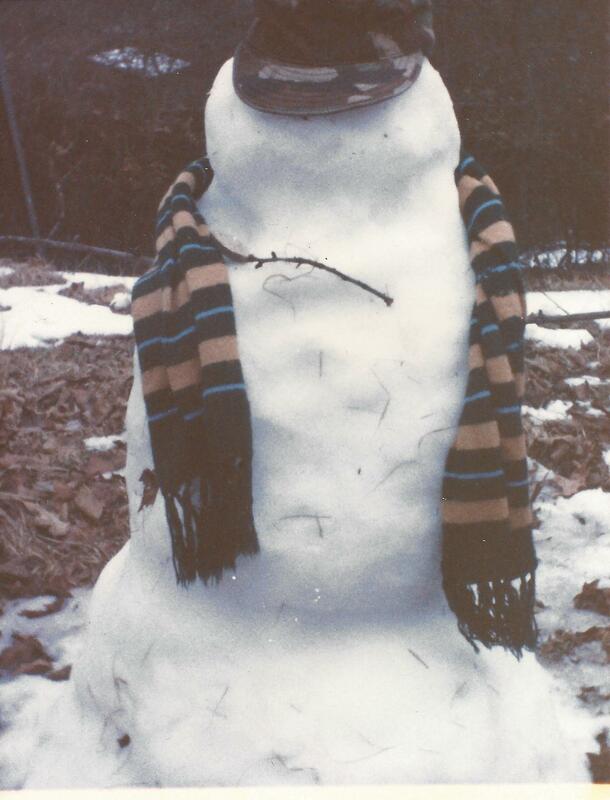 My sons made this 4-foot-tall soldier snowman in 1993. This shot was taken on Day 4 of the blizzard. The next morning, the roof of my detached carport sagged under the weight of the snow, threatening to smash my new car, a Geo Prism. A tree just outside my back yard had fallen onto my fence and my neighbor’s fence, fortunately missing both houses. My insurance company would pay to fix the carport and fences, and have the tree cut up and removed. My sons each donned my Army boots – neither can fit my boots any longer – put on layers of clothes and went traipsing around the neighborhood to join other kids at play. As the weekend editor at the Anniston Star, however, I had to go to work, and since my car was covered in snow and the streets yet to be cleared, I fabricated a sled out of cardboard and a plastic bag and slid on my bum down the hill to work. Turns out, for the first time in the newspaper’s history, papers couldn’t be delivered. Not that day or for several days afterward either. The city had shut down, with the exception of Waffle House and a radio station (The DJ couldn’t leave, and no one could come in to relieve him; the station ended up being the conduit for requests for help and offers to assist.). Waffle House became the community center and the only source for outside foot – if you could get there. I sent reporters to both places for interviews. Even though we couldn’t distribute the papers, we still printed them, ultimately wrapping the current edition around the old ones when the roads were clear enough for carriers to make deliveries. Students got five days out of school. I was in my final semester of an education degree and was doing my student teaching at a middle school at the time. When the students returned, eager to share their experiences, I told them they could not speak about it in my class. Instead, they had to write about their storm experiences. Write, they did. Even the boy so unmotivated that his only participation thus far had been taking the weekly spelling tests wrote. Because we had been working on drama, they students wrote essays, then plays and then chose characters to act out their experiences. The unmotivated boy even volunteered to act in each play, at one point playing the role of the family cat. That blizzard provided so much fodder for great stories – and provided clarity for me. That congratulatory letter was from a school in Florida, a school that had given me 30 days to reply with my intention. Hmm. Snow in St. Louis or sunshine in Florida. A maybe vs. a promise of four years with full tuition and a stipend. The blizzard of 1993 indeed changed my life – for the better.